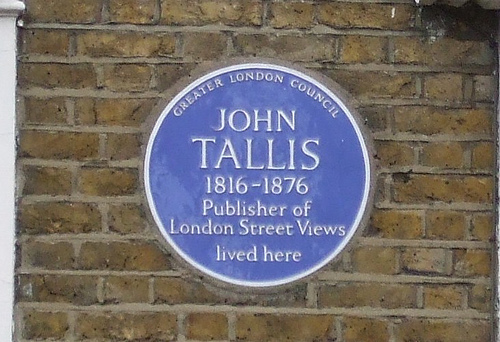 It is about the London Street Views that John Tallis produced from 1838-1847. He produced 88 street views in small oblong booklets between 1838 and 1840, with an additional 18 revised and enlarged several years later. The header of this blog is from number 29. The views all include a 2-page engraved elevation showing the separate properties, some with the name of the proprietor or shop engraved on it, but most just with the number. Surrounding this engraving were several pages of advertisements and an informative text about the street shown. On one side of the engraving Tallis showed a street map, on the other side a ‘vignette’, an illustration of a building or landmark pertaining to the elevation. Also included was a street directory listing all the shops and side streets. The booklets usually cost 1½d (sometimes 2d). This low cost is no doubt explained by the advertisements which are partly from businesses in that particular booklet, but also from other shops in different streets. It is thought that the shops that had their names engraved on the elevation had had to pay for the privilege, otherwise it cannot readily be explained why only some had names. This blog will show individual shops, where possible with a bit of background information or additional illustrations. There will not be any street order in the way I post; it will be where my fancy or the information available leads me, but I will provide an index, tags and categories, so anyone interested in just one street can find the properties on that street in one place. Because my other blog is about existing buildings and places you can go and see, but not everything Tallis wrote about is still extant. This blog is about lost shops and businesses of the past. Having said that, some may still exist, although not necessarily in the same place or changed beyond recognition, so where possible, I will tell you the current status and whereabouts. Most genealogical information, such as baptisms, marriages, probate and census records, is obtained through Ancestry.co.uk and is not referenced individually to avoid too lengthy footnotes. All other sources are cited. Photographs are credited where necessary, although most material is derived from out of copyright publications. There is a danger in linking to other sources on the web as websites get changed, moved, or taken off completely. Should you find a dead link in any of my posts, would you please be so kind as to alert me to the problem via a comment or an email? Many thanks for your help. If you want to know more about me, have a look here. This blog can be cited or used (of course preferably with due acknowledgement) for non-commercial purposes. Any reuse for a commercial reason is not allowed. For those who are familiar with Creative Commons: the relevant icon below. I came across your blog while looking for information on a chemist and druggist shop at No 30 Piccadilly which was owned by a John Ambridge from about 1801-1820. I wondered if any of the drawings showed that shop. I believe he was my great great grandfather albeit through a second, illegitimate family! Yes, 30 Piccadilly is shown in the Street Views, but no Ambridge there. The place is listed for one Faulkner, artists’ colourman. I have not done any research on the address yet, so no idea whether he came after Ambridge or whether there are others in between. There is an Ambridge listed for 123 St. John Street, a corn factor apparently. Another relation of yours? I can send you a picture of 30 Piccadilly if you like. Thank you for your reply. He was certainly there in 1814 according to the Post Office Directory, although I have not research exact dates. He lived in Westminster with his wife Martha Circuitt but they moved back to Clerkenwell some time before 1829 when he went into business first with someone called West and then with his brother James as a corn merchant at 123 St John Street. From 1822 he went on to have six children, including my great grandfather, with another Martha, (my great grandmother). I should very much like a picture of 30 Piccadilly if it’s not too much trouble. My email is diana.sue@btopenworld.com. Kind of you to offer, but no thanks, I am de-cluttering myself. Good luck decluttering. It is an exhausting process! Thank you for your prompt reply. My ancestors owned the Fenton Hotel at 63 St. James Street in Westminster. I saw the Tallis drawing in the Library of Congress in Washington, D.C. Wonderful drawings and very nice of you to put them on line. Thank you very much for your website. I am researching the early history of photography in London and I have some addresses that I wonder if you have illustrations or notes on. First being Claudet and Houghton – glass suppliers 89 High Holborn, second the address for the Medical Hall near Furnival’s Inn 137-142 Holborn (Bars) and third, Dymond and Co. – chemists, 146 Holborn (Bars). All dated 1840. Thank you. I have not researched Claudet/Houghton and Dymond yet, so do not have much material on them, but I will send you an email with a few things. The Medical Hall is not that close to Furnival’s Inn; Tallis has one at number 229 High Holborn. Is that the same one you are interested in? Baldwin. Thanks for putting this wonderfull site together,i collect 18th century wooden planes from London based makers/dealers etc,i have loads of names and addresses of said makers,i intend on getting the enlarged version of the book and I wonder if you can tell me when these buildings were built so I can marry up the street numbers with the images in the book,thankyou in anticipation of your answer.best regards.Peter. Thanks for your comment Peter, much appreciated. The buildings Tallis shows are from various periods, some quite old, but some only recently (re)built when the Street Views came out (c. 1840). The names and addresses are therefore 19th century and the planes you collect are from an earlier period, so it is quite possible that the makers had disappeared by then or that their shops had been taken over by someone else. Is there anyone in particular you are interested in? Thomas Deeley,12,mortimer mkt,tottenham court rd,1859-88. J.V.Hill,sun st, and 5 Chichester place,grays inn rd,1842-63. Sorry Peter, these addresses are not in streets covered by Tallis. I checked for the names, but no plane or tool makers among them. I will send you a list of the tool makers that are in Tallis by email. Hello, thanks for your very interesting website. While doing family research i found that an ancestor, a tallow chandler, has a shop at 65 Cockspur street and is listed in Tallis’s pamphlet. Just wondering about the context of this find- does that denote that he was pretty successful in his field? Or maybe not. I am curious to know and any information you can offer would be gratefully received. Hi, thanks for your kind comment. Is your ancestor Elford? In the Tallis index, he gives the address as 65 Charing Cross & Trafalgar Square, but that is probably interchangable with 65 Cockspur Street. Tallis depicted the best-known and/or fashionable streets, not the smaller street which no doubt also had shops, but that does not mean the individual shopkeepers were always succesful. There are plenty of bankrupts amongst them. I have not researched your tallow chandler yet, so cannot tell you much, but am happy to bring him forwards and look into him. Do send me an email if you like more information or if you can tell me a bit more about him (baldwin.hamey [at] gmail.com). Hello. I’m trying to pinpoint the exact location of the stationer and printseller Samuel Fores’ first shop at No 3. Piccadilly. Fores’s business was based there from 1783 until 1795, at which he point he moved up the street to No. 50 at the corner of Piccadilly and Sackville Street. The Museum of London’s digitised version of the Tallis Street Views from 1840 puts No. 3 at the eastern extremity of Piccadilly, almost opposite the northern end of Haymarket, which is consistent with the description of the shop’s location which appears on Fores prints. However, I know that the street numbering in Piccadilly was changed during the early nineteenth-century and so cannot be certain whether this is the same building or not. I would have assumed that there is a possibility that the original No. 3 Piccadilly could have been one of the buildings which was demolished to make way for Piccadilly Circus in 1819. I’d be very grateful for any information that you can provide. That is an intriguing question. The tax records for Westminster are rather scanty, or at least they are on Ancestry and don’t help much. I can, however, tell you that the number 3 in Tallis’s booklet was not demolished until the latter end of the 19th century. I will email you some pictures to show you. Another point that may help is that Joseph Egg, the gunsmith, also described his shop as being at the top of the Haymarket and he is definitely at number 1 (see https://londonstreetviews.wordpress.com/2013/02/18/joseph-egg-gunsmith/). I am searching for any known view of Brunswick Row, a place that no longer exists. It used to be a small street that ran off the north west side of Queen Square in Bloomsbury. I imagine it was not important enough to be in Tallis but thought it would be worth a shot to ask. I am afraid I will have to disappoint you. Tallis did not depict Queen Square, nor Guilford Street, so no Brunswick Row either. Sorry. Thanks for letting me know Katherine. I fixed the problem and the link should now work again. and click the Tallis view. This business formerly occupied 6&7 West Smithfield. Thanks for the link to the information about 6-7 West Smithfield. It is wonderful to read how much you have managed to find out about the history of the firm by delving into the archives. As you must have gathered, the information on the premises in West Smithfield is exactly the sort of thing I am looking for in all my blog posts. I will have to try and find things to say you haven’t said already when I get round to writing the one on 6-7 West Smithfield :). I’ll make sure to link to your site when I publish my post. I am writing a biography of Samuel Cook who worked for the Sydney Morning Herald from the 1850s until the early 20th century. Before he went to Australia, Samuel worked at William Clowes and Son – which is what led me to your blog. May I use the image of the Applegarth & Cowper Press in my book? I will, of course, cite your blog as the source for the image. With many thanks. Of course you may. The illustration is from George Dodd’s book which is freely available online as long out of copyright, so I do not really have any claim to it. But a reference to my blog if of course appreciated. Good luck with the Cook biography! Superb site – well done! Wonderful – many thanks for sharing the information & drawings. What a wonderful blog! Have you found any businesses that still exist? Fortnum and Mason, Hatchards and James Smith umbrellas spring to mind. Thanks for your kind comment and yes, some of the shops that Tallis depicted still exist. Not always in the same old building and sometimes with different goods on offer, but see for instance https://londonstreetviews.wordpress.com/2015/01/07/george-and-richard-attenborough-jewellers-and-pawnbrokers/. Thanks so much Baldwin, really appreciate it. What a wonderful discovery is your blog! Congratulations! It is very interesting! I have found you casually looking for information about Henry Stacy Marks that has taken me to Langham Place… I am very interested in finding information about the Langham Chambers, also in Langham Place, where the Artists’ Society was and painters like Millais or Lowes Cato Dickinson they had workshops. Do you have any information of this building? Forgive my English and greetings from Spain. Thank you for your kind comment. I am glad you like my efforts. Langham Chambers were built after the Tallis Street Views came out, so they cannot be found there, but I had a look and there is information here: http://www.ucl.ac.uk/bartlett/architecture/sites/bartlett/files/chapter19_langham_place.pdf. Hope this helps. Thank you very much, Baldwin. You’ve been very kind. Again, thank you very much for your effort and your work. You might find the cork cutting Newtons of St. John Street, West Smithfield, an interesting subject for your absolutely fascinating blog. I believe that their premises (now numbered 69-73, but originally No. 50 or 55) are shown on one of Thomas Tallis’s street views. From the research I have done, the family seems to have had a presence on the street from at least 1817, if not earlier (there is a newspaper report of a fire in Mr Newton’s cork warehouse in St. John Street in March 1791), until just prior to World War 1. Newton and Son, cork cutters, are indeed listed by Tallis at number 50, but I have not done any research on them, so no information on them yet. I will look into them in the near future, but not straightaway as I am working on a few others at the moment. If you have any information on them you would like to share, please email me baldwinhamey[at]gmail.com. Full credits to you of course if I use it in my post. Very interesting about Lambs Conduit St.,different personalities and such a variety of occupations. Starting from 1813 onward 3 brothers from the White family lived at three different locations on Lambs Conduit #1, # 68 and #73. They were distant relatives, my understanding is that two were surgeons and the other a surveyor. Thank you for a most enjoyable read – gives a real window into people and historical period they lived in. Thanks for you kind comment. Glad you found the blog of interest. I had a look in the Tallis index (±1839) and he mentions the two White surgeons, at numbers 1 and 73. As you probably gathered, the surveyor had disappeared by then. I have not done any work on the Whites, so cannot yet tell you anything about them, but will no doubt get round to them some time in the future. What a wonderful blog! My research led me to Dolby’s Dining Rooms as my GGG grandparents turned out to be Samuel Dolby (1795-1848(?)) and Charlotte Niven (1796-1.7.1866). Samuel was one of 8 children born to Thomas Dolby b.25.12.1744 and Mary Plowright b.1749 and lived in Sawtry, Huntingdonshire. Samuel and Charlotte had 8 children, the first of whom was actually my GG grandfather, John Dolby (1819-1884). Helen Charlotte who became known as Helen Charlotte Sainton Dolby was their second child – my mother was christened Glory Sainton Dolby when she was born almost 100 years later in 1916. You refer to Samuel’s brother Thomas Dolby’s Memoirs …(1827). You may be interested in a wonderful web-based publication The Printshop Window – Caricature & Graphic Satire in the Long Eighteenth Century, on Thomas Dolby’s career. He was an amazing character. Anyway, I thought the existence of John Dolby might be of interest to you to consider for inclusion in your blog. Have not done any work on these two gentlemen, but will send you two pictures via email you may find interesting.